We’d love your help. 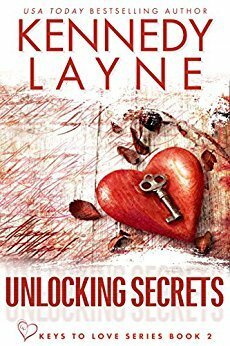 Let us know what’s wrong with this preview of Unlocking Secrets by Kennedy Layne. A trip down memory lane with the man who’d broken Brynn Mercer’s heart wasn’t the smartest thing she’d ever done in her life, b A grim discovery in Lance Kendall’s home proved one thing—the residents of Blyth Lake had a serial killer in their midst. Now Lance had unintentionally put a target on his back. Worst yet, he’s made the only woman he ever loved known to a murderer. To ask other readers questions about Unlocking Secrets, please sign up. I am about to be completely frank with you. I have a love hate relationship with Layne’s stories. I love her writing and how she can intertwine so many books together but make them individual stories. With that said though I hate that I never know what’s happening next! When I say hate I don’t really mean it. Layne gives you a story about a couple coming together when stuff around them is falling apart but never gives you a clue as to who’s behind it. Brynn and Lance were best friends turned lovers when they were younger. They knew the score and that they weren’t going to have a happily ever after then, but what about now? I love how strong Brynn is and how she handles herself yet knows when to let Lance’s alpha tendencies sway her when its needed. Lance knew when getting ready to come home after 12 years away it would be an adjustment he just didn’t realize how fast things would change, in a good way. So, while these two are falling back in love they have a black cloud hanging over the towns head. There is a serial killer amongst them and they have no idea who it is. I love suspense murder mysteries and I usually pick out who the killer is early on. But with how Layne writes you can’t do that, you’re stuck waiting to find out and it makes for a great read. I can’t wait to see where she takes the rest of the series. I loved every moment of this book and every moment spent with both Brynn and Lance! Both Brynn and Lance are strong characters with their own minds who are fiercely loyal to those they hold dear. Both exhibit kindness and generosity of spirit as well. Their love story is one of love put on hold as each of them went their own way, matured, and gathered experience. However, the moment they came back together, they both recognized that they were home in the truest sense and just had to come to terms with what that meant and how to handle it. The addition of mystery on multiple levels only increases the reader’s fall into the book as it keeps the reader guessing and wondering while enjoying every moment of Brynn and Lance’s reconnection with one another. I have to know how the mystery ends! The writing style is wonderful as well since it draws you in from the first moment and keeps you interested. Overall, an awesome book that I couldn’t put down. I loved every moment of this book and every moment spent with both Brynn and Lance! Both Brynn and Lance are strong characters with their own minds who are fiercely loyal to those they hold dear. Both exhibit kindness and generosity of spirit as well. Their love story is one of love put on hold as each of them went their own way, matured, and gathered experience. However, the moment they came back together, they both recognized that they were home in the truest sense and just had to come to term I loved every moment of this book and every moment spent with both Brynn and Lance! Both Brynn and Lance are strong characters with their own minds who are fiercely loyal to those they hold dear. Both exhibit kindness and generosity of spirit as well. Their love story is one of love put on hold as each of them went their own way, matured, and gathered experience. However, the moment they came back together, they both recognized that they were home in the truest sense and just had to come to terms with what that meant and how to handle it. The addition of mystery on multiple levels only increases the reader's fall into the book as it keeps the reader guessing and wondering while enjoying every moment of Brynn and Lance's reconnection with one another. I have to know how the mystery ends! The writing style is wonderful as well since it draws you in from the first moment and keeps you interested. Overall, an awesome book that I couldn't put down. I love a good murder mystery and boy, does Layne deliver! Usually I can figure out who the killer is pretty early on but not here, we're two books in and still, we have no clue. Don't worry, the characters don't know either! This is a great coming home story. Guy and girl grew up together, got involved in a "no strings attached" love affair before he goes away to defend his country. Upon his return, things heat up in more ways than one. Brynn is still the girl his heart (and other parts!) craves I love a good murder mystery and boy, does Layne deliver! Usually I can figure out who the killer is pretty early on but not here, we're two books in and still, we have no clue. Don't worry, the characters don't know either! This is a great coming home story. Guy and girl grew up together, got involved in a "no strings attached" love affair before he goes away to defend his country. Upon his return, things heat up in more ways than one. Brynn is still the girl his heart (and other parts!) craves and she's right there with him! But there's a killer on the loose and he's getting closer all the time. Time is running out to catch him before he strikes again! What started with Unlocking Fear, continues with Unlocking Secrets. You absolutely need to read book 1 first or I suspect that you will be a little lost. You know, considering what is going on in this community, this is a suprisingly drama free read. That might seem odd, but you'll know what I mean when you read it. It flows so easily that I was just carried along with the story. I particularly enjoyed how the author was able to sow the seeds of suspicion about the residents. It didn't feel fo What started with Unlocking Fear, continues with Unlocking Secrets. You absolutely need to read book 1 first or I suspect that you will be a little lost. I particularly enjoyed how the author was able to sow the seeds of suspicion about the residents. It didn't feel forced at all. What the author has managed to create is a genuine feel of community and family with this series. And to do so within such a limited page count thus far is impressive. After serving his country for 12 years Lance has returned to his hometown but what he finds in the house he is renovating puts himself and everyone close to him in danger. Brynn and Lance were together when he left the town and her 12 years ago. At the time she knew it was inevitable, but it didn’t make it any easier when he left. As they investigate the suspicious goings on in the town it brings them closer, but will this be their second chance or are they destined to go their separate ways once After serving his country for 12 years Lance has returned to his hometown but what he finds in the house he is renovating puts himself and everyone close to him in danger. As they investigate the suspicious goings on in the town it brings them closer, but will this be their second chance or are they destined to go their separate ways once again? I think that I should read all the books in one sitting once all of them have been published because we are making a very slow progress for me, I want to know who is the killer now. I have gotten a little too invested in the series and I have become a big fan. You should read this book. We made some progress when it comes to finding out who killed those poor girls. The mystery is still unraveled, unfortunately. To be honest, the book wasn't as good as the first one, but it was still captivating. I think that I should read all the books in one sitting once all of them have been published because we are making a very slow progress for me, I want to know who is the killer now. I have gotten a little too invested in the series and I have become a big fan. Wow. What a story from start to finish. I was literally drawn in on page one and could not put this down. The writing keeps you in suspense the entire way. I thought I had figured out "who done it", but nope the author kept me guessing the entire book, and I loved it. The main characters, Lance and Brynn, have you rooting for them, even with their hang ups and everything that is going on in Blyth Lake. The chemistry between the two leapt off the pages, so you know they are meant to be together. I Wow. What a story from start to finish. I was literally drawn in on page one and could not put this down. The writing keeps you in suspense the entire way. I thought I had figured out "who done it", but nope the author kept me guessing the entire book, and I loved it. I am anxious to read the remaining books in this series, as this was definitely a page turner. The second book in the Keys to Love series gives us the story of Lance & Brynn, high school sweethearts. Lance returns home to find his hometown is on the search for a serial killer and his family is in the crosshairs. He reunites with Brynn and finds the sparks never went away. Together they work to help find a murderer in their small town. There are surprises at every corner that you will never see coming! Don’t miss this series! I could not put this book down!! Just when u think u know what’s going to happen something different does!!! I didn’t enjoy this one nearly as much as the first but I’m not giving up on the series yet. I like the introduction of new characters in each story, with the wrap around of the others we've already met. These characters held true for me. But I really love the second chance genre. The book is suspenseful, intense, sweet, funny and smexy! Can't wait to hopefully learn all the secrets about the killer's identity in book three! Bring it on!